We are delighted to announce that Clinic4Sport will be the sole provider for Sports Therapy at Cambridgeshire Bike Show in 2018. 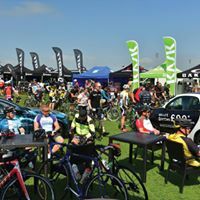 This is a great cycling Festival taking part from 1st to 3rd June in Peterborough and includes various riding disciplines for the entire family: Chrono, Grand Fondo, classic bikes, folding bike races and many more! Check it out! In 2018, we are delighted to announce that ToC will host the brand new Cambridgeshire Bike Show. The show is being organised in conjunction with our retail partner’s, Rutland Cycling. CBS will cater for those interested in the latest carbon and kit designed for speed but also for those with an interest in riding on gravel tracks and for families wanting to purchase their kids a new ride. You’ll be able to find bikes, parts, accessories, clothing and apparel, merchandise, safety and storage, plus much much more at the Bike Show. Entrance into the Cambridgeshire Bike Show is completely free to visitors so keep a look out for all the updates on stalls and stands you’ll find. If you wish to be an Exhibitor at the Cambridgeshire Bike Show, please contact Jess at jess.lockhart@golazo.com. If you’d like more information about the event, please let us know.